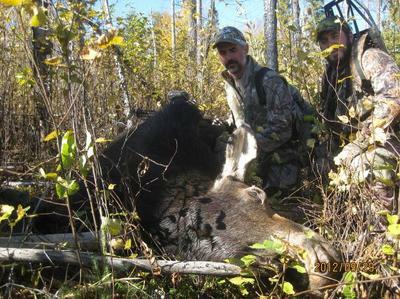 This fall my two sons and I went on a successful archery moose hunt in Ontario Canada. As I was sitting a fallen burnt aspen tree trunk, each son filled the crystal clear morning with the sounds of a cow moose calling for a mate and that of a bull answering, I had to ask myself how did this moose hunt come about. I had to go back fifty-nine years ago to answer my own question. I was eight years old and lived on a small dairy farm in northern Wisconsin. I loved the outdoors and took every opportunity to explore and experience everything it had to offer. I would often go some small place in the woods and wonder if I was the first person on this earth to touch or see what I was experiencing at that moment. My dad, Carl, loved to hunt, and at my young age I somehow understood hunting was something special. I probably knew it was special because he would talk about hunting any month of the year to anyone who wanted to join in the discussion. Because of the delightful pictures about hunting that he painted with his words, I was very curious to experience this special time of the year when he would harvest meat for our large family. I repeatedly pleaded with him. “I won’t get cold because mom will dress me warm.” He would just bend down and give me a hug. My young mind would not comprehend why he always left me behind. Now I know it was because he wanted my first hunt to be special. But thinking back, I am sure it broke his heart He always took a deep breath before he looked at me. I always thought I could see a tear in his eye as he ended the negotiations, not by saying a word but by shaking his head back and forth. Then on October 11,1954 his 40th birthday he determined that on his special day it was time to make it my special day as well. Without asking him this time but just looking up towards him, his head nodded up and down instead of shaking back and forth. My heart soared as I realized I was finally being included in this hunt. It was a perfect fall morning, with robin egg blue skies and a slight frost. 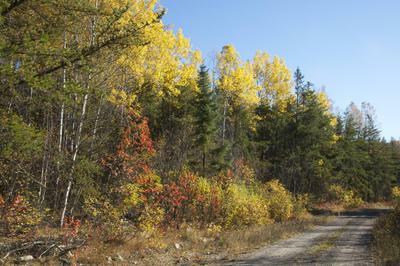 The golden aspen leaves fluttered down like an angel was sprinkling magical dust on us. I will never forget this special day 59 years ago, and I encourage any father or grandfather to take their young ones out and make the outdoors a special time for them, too. It only happens once… hunting is something special. Don't wish it was you, just do it. I remember almost the exact same thing happening to me with my dad. Only difference I never got to go moose hunting with my two sons. Are you a lucky man. Every time I read this I get a tear in my eye.